A number of people have been arrested after Thames Valley Police conducted several warrants in connection with a series of ATM burglaries in Oxfordshire. On Wednesday, November 21, officers from Thames Valley Police, working alongside partners from Wiltshire Police, Gloucestershire Police, West Mercia Police, the National Crime Agency, South West Regional Organised Crime Unit (ROCU) and West Midlands ROCU, conducted a number of early morning warrants. Partners from the Government Agency Intelligence Network (GAIN) and the Regional Disruption Team also assisted with the warrants. The warrants were carried out as part of Operation Shire, which is an ongoing investigation into cash machine thefts across Oxfordshire, Gloucestershire, Wiltshire and Worcestershire. Senior Investigating Officer Detective Inspector Jim Holmes, of Force CID based at Banbury police station, said: “This was a Thames Valley Police-led series of warrants executed at several addresses across four counties, Oxfordshire, Gloucestershire, Wiltshire and Warwickshire. “The warrants are part of an investigation into cash machine raids. • A 39-year-old man from Cheltenham arrested on suspicion of conspiracy to burgle. • A 43-year-old man from Evesham arrested on suspicion of conspiracy to burgle. 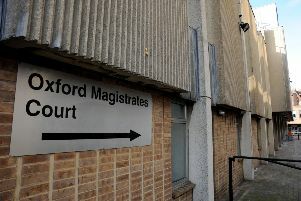 • A 31-year-old woman from Carterton arrested on suspicion of perverting the course of justice.